No player from Canada has ever claimed the Southern Hemisphere’s most prestigious poker title, but once there were only two players remaining at the 2014 Aussie Millions Main Event final table, it was guaranteed that a Canuck would be the champion. Ami Barer, known online as “UhhMee”, ultimately overcame a total field of 668 players after defeating fellow Canadian Sorel Mizzi heads-up to claim the $1.6 million first-place prize, all the glory and the beautiful Aussie Millions gold bracelet. When the final table began it was Barer who had the chip lead, but he was faced with stiff competition from the likes of Vincent Rubianes, Sorel Mizzi, Jake Balsiger, Scott Seiver and Darren Rabinowitz. Below is how they stacked up at the beginning of play. Seiver, one of the most accomplished players at the final table, started with the shortest stack and struggled to win chips early. Then he doubled up when he found the cards he needed holding preflop against Balsiger’s . From there Seiver hung onto life, doubling up once again when he woke up with pocket kings, which helped him survive to the dinner break. When the players returned Seiver three-bet shoved holding after Darren Rabinowitz had opened. Rabinowitz called with his and Seiver couldn’t win a flip. Finally, after around three hours, the first player had been eliminated. Seiver pocketed $170,000 for that effort. Just a short while after Seiver’s elimination and the lone Aussie at the final table, Andrew Phaedonos, was sent home in 6th place for a $250,000 score. He was short stacked when he shoved preflop holding and couldn’t improve against Sorel Mizzi’s . Up to this point Mizzi was the biggest chip mover, while start-of-day chip leader Ami Barer had got unlucky in a few spots and had fallen down the leader board. Rabinowitz started catching up to Mizzi when he dealt the fatal blow to Vincent Rubianes in 5th place. Rabinowitz woke up with when Rubianes shoved preflop holding . The board gave Rubianes a flush-draw sweat, but ultimately he was eliminated with $335,000 for his time. Following a couple of relatively fast eliminations it was back to grinding. It wasn’t until around 2:45am that the final table would lose another player. Unfortunately for Rabinowitz, it was he who would fall in 4th place. Rabinowitz was quite short stacked when he four-bet shoved holding against Barer, who held . No help for Rabinowitz and it was three-handed. It would be just 20 minutes after Rabinowitz’s elimination that we would lose Jake Balsiger in 3rd place. Balsiger was lucky to wake up with and get all his chips in against Barer who held . However, the board meant that Barer had made a miracle straight and with that Balsiger was sent home in 3rd place. Two players remained as the heads-up battle began at around 4:00am. Two Canadians fighting it out for $1.6 million and the beautiful Aussie Millions Main Event gold bracelet! Barer began heads-up with more than a 2-1 chip lead and would increase that lead during the first few hands of action. Barer was doing everything he could to stop Mizzi from winning the title and eventually would send Mizzi home as the bittersweet runner-up. After eight days of poker, the final hand of the 2014 Aussie Millions began with Ami Barer opening the button with a raise. Sorel Mizzi then shoved his short stack all in from the big blind and Barer instantly called and tabled the best looking starting hand in poker – . Mizzi held just and would need some help. The board ran out and it was all over! For his 2nd place finish Mizzi takes home $1 million. 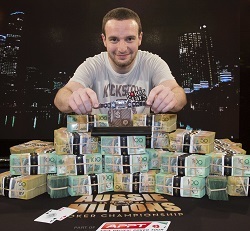 This result is added to Mizzi’s already impressive record in the Aussie Millions Main Event. He finished 16th, 9th and 3rd in three consecutive years from 2009 through 2011 and now adds a runner-up finish to his resume. Mizzi is also the only player to make the final table on two separate occasions. This runner-up finish will surely make Mizzi even hungrier to win the title next time around. Congratulations to Ami Barer for winning what is his breakout major live tournament result. 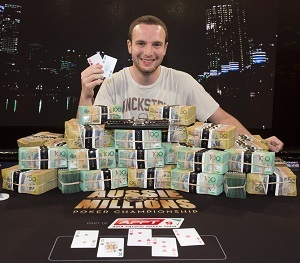 Prior to the $1.6 million Barer received for winning the Aussie Millions Main Event, his largest result was US$180,064 and his total live earnings were well under $500,000. He does, however, already have a very impressive online poker resume as he has posted just under US$6 million in results. Ami Barer is not the only one that needs congratulating. The team at Crown Poker, in partnership with the Asia Pacific Poker Tour, have done a marvellous job running another world class Aussie Millions Main Event. It’s the first time the field size has increased in three years and can only be a sign of bigger and better things to come! Make sure to keep your browser locked to Poker Asia Pacific and like our Facebook page, follow us on Twitter, or join our Asia-Pacific and Australian poker forum to stay up to date with all the latest news and results from the 2014 Aussie Millions Poker Championship.